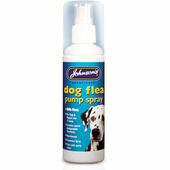 Large dogs need lots of exercise to stay fit and healthy, but all that time spent outdoors gives fleas plenty of opportunity to jump on and get a lift back into your home. 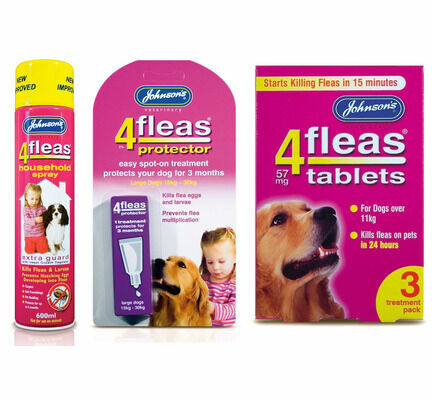 Our large dog flea bundle contains everything you will need to keep your dog and your home free from flea infestation, and will also eradicate any fleas that have already taken up residence in your home. 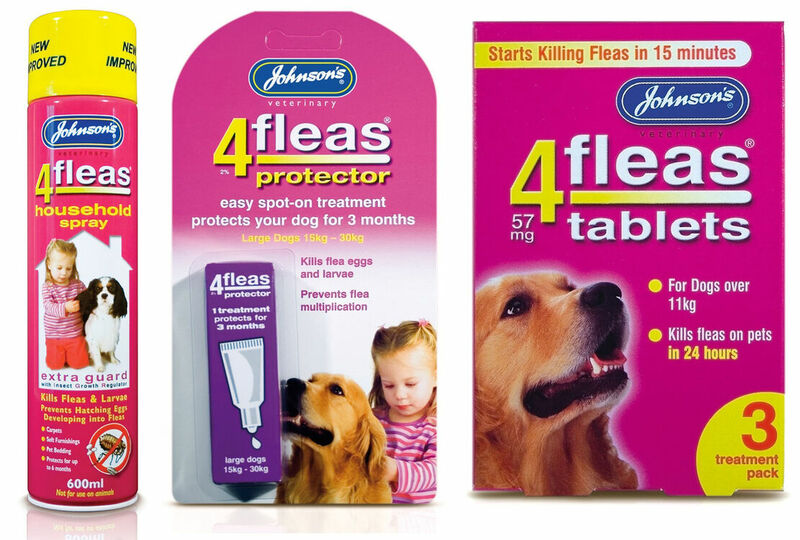 Johnson's 4Fleas Spot-On Protector For Large Dogs (15 - 30kg) - Designed to destroy flea eggs before they get the chance to hatch, this spot-on treatment will also kill flea larvae and provide your dog with up to 3 months of protection. 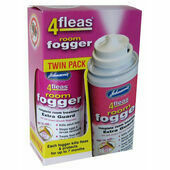 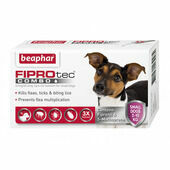 Suitable for dogs between 15kg and 30kg. 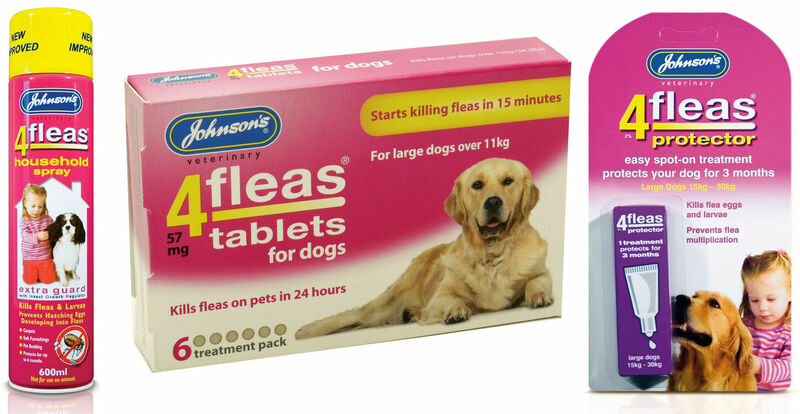  Johnson's 4Fleas Large Dog Tablets (3 treatment pack) - Made using a fast-acting formula that starts to kill fleas within 15 minutes, these tablets will kill any flea living on your dog within 24 hours. 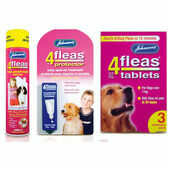 Suitable for dogs over 11kg, each pack contains 3 tablets. 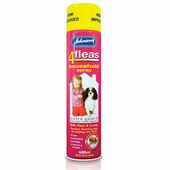 Johnson's 4Fleas Extra Guard Household Spray (600ml) - Every dog's home ought to be protected against fleas as well as other insects, and thanks to this protective spray's Insect Growth Regulator, your home will be safe from safe from infestation for 6 months. 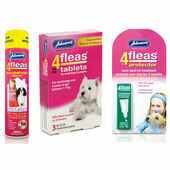 This bundle is a must have for owners of large dogs, and when the three are used together they provide months of protection against fleas, their larvae and their eggs. 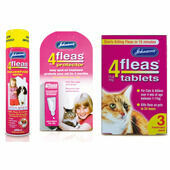 Please note: The 4Fleas Extra Guard Household Spray is only suitable for use around the home and should not be sprayed directly onto your pet.